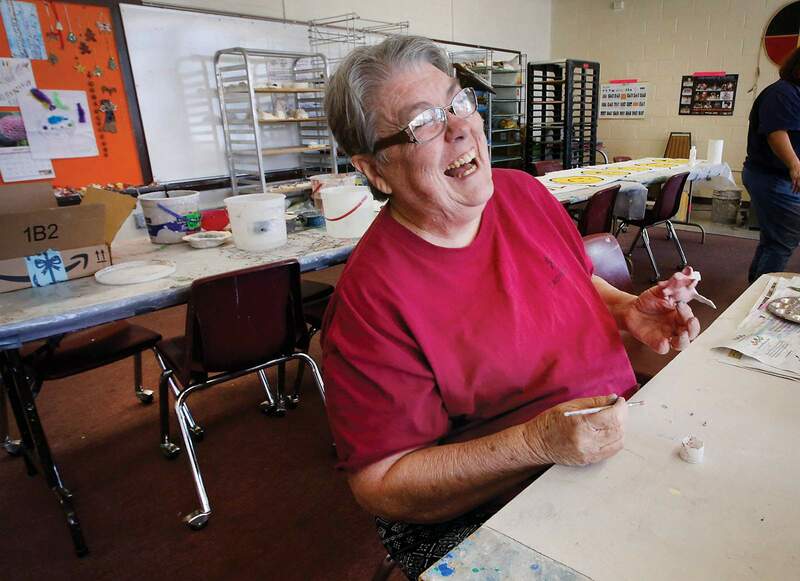 Bonnie Woodward, an art instructor at the Education Literacy Health Inspiration (ELHI) Community Center in Ignacio, works on a clay project in the studio where she leads open studio time on Tuesdays. Woodward’s classes are one of several offerings at the center aimed at improving health in Ignacio. IGNACIO – Bonnie Woodward’s depression and post-traumatic stress disorder are the result of a house fire, the loss of a child, physical abuse and other trauma. The trauma and poor mental health also led to several suicide attempts. Most recently, four years ago, she tried to take her own life after losing her business, an art studio. “It was a very dark time for me,” she said. 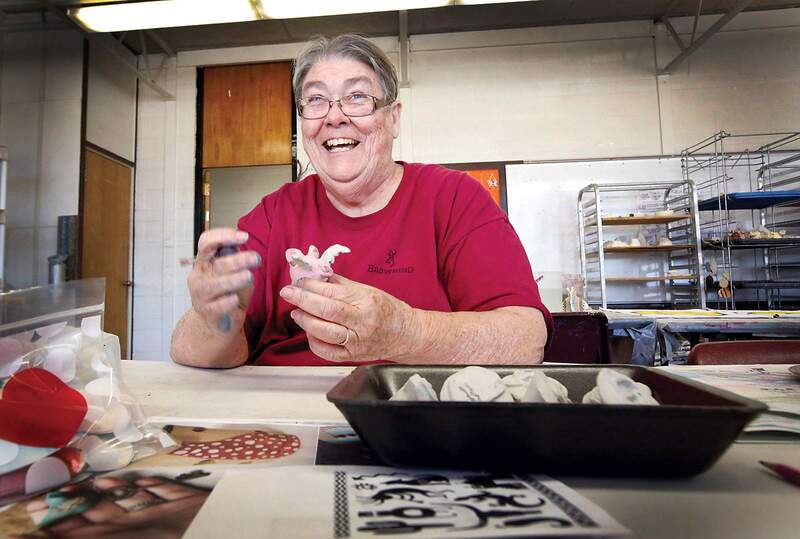 Art, particularly handmade ceramics, was key in her recovery. Woodward has since found a place to create at the Education Literacy Health Inspiration Community Center in Ignacio. She credits the center as a major factor that allowed her to achieve stable mental health. “It’s a safe place to talk. It’s a safe place to create,” said Woodward, an Ignacio resident. To share the healing she’s experienced with other adults, Woodward started running open studio sessions once a week through the Dancing Spirit Community Arts Center at ELHI two months ago. She is proficient in many art forms and will work with adults on whatever they are interested in. “Art saves lives, it truly does,” she said. The open studio sessions are one of several health-centered programs that have started in the ELHI center near the intersection of Colorado highways 151 and 172 since it opened in 2015. 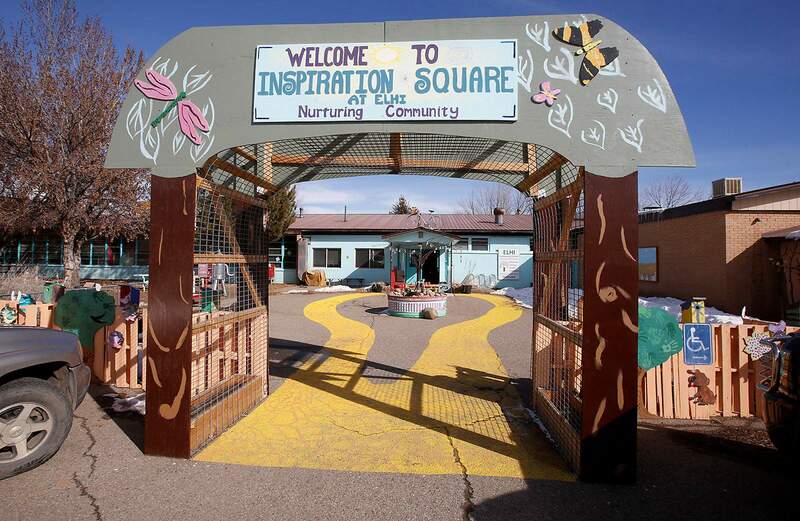 The nonprofit operates in the former Ignacio Elementary School, a 42,000-square-foot building that provides space for a Christian school; church; home school enrichment program; three psychologists; free clothing closet; Dancing Spirit’s art, dance and yoga classes; and after-school programs run by the Southern Colorado Community Action Agency, said Cora Shubert, site manager. The Education Literacy Health Inspiration Community Center in Ignacio opened in 2015. The center is a nonprofit that provides space to a variety of tenants, including a church; school; and dance, art and yoga classes. “It’s done a lot to draw the different entities in the community together,” she said. As the center has matured, it also provided space for cooking classes, Alcoholics Anonymous meetings and the Southwest Center for Independence, which works with disabled residents once a week. Shubert also recruited San Juan Basin Public Health to meet with clients of the federal nutrition program for women, infants and children, often called WIC, she said. Founding ELHI board member and artist Kasey Corriea said the center is helping to serve the community’s mental, physical and spiritual needs. In the future, Corriea said she sees potential for the center to house music programs, a food pantry and space for families to meet with La Plata County social services representatives. The center’s growth will be driven by a strategic planning process that will get started in the summer after new ELHI board members are elected, she said. “We need to find out from the community: ‘What else do they need?’” she said. Corriea sees mental health as one of the community’s main needs and tries to help address it through Dancing Spirit, an organization she helped found. While Dancing Spirit doesn’t provide art therapy, working on art projects can help students to process trauma caused by family conflict and substance abuse, she said. Art helps people who are overly active become more focused and provides a medium for people who struggle to communicate to tell their story, Corriea said. For Woodward, art was an important outlet for dealing with pain from trauma, including sexual abuse and domestic violence. Bonnie Woodward, an art instructor at the ELHI Community Center in Ignacio, works on one of her clay projects in the studio where she leads art classes. She is particularly fond of hand-molding clay. 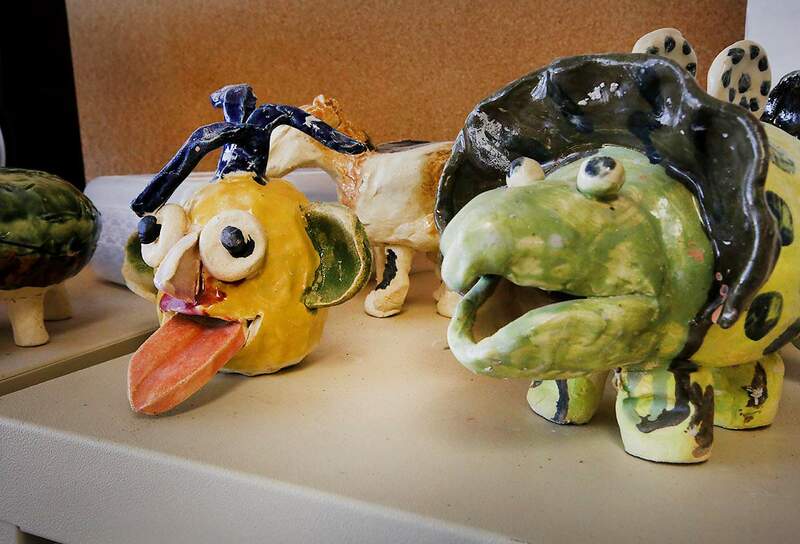 Bonnie Woodward, an art instructor at the Education Literacy Health Inspiration (ELHI) Community Center in Ignacio, gets a thrill seeing the creations her students make. She works with adults and children through Dancing Spirit Community Arts Center. After finishing an art therapy program in Tucson, Arizona, Woodward founded an art studio called The ART Project for artists like herself to continue recovering. The studio closed after her landlord gave her five days to leave. The loss of the studio was devastating to Woodward, so much so that she attempted to take her own life. After the attempt, she moved in with her son in Cortez to recover. She doesn’t consider herself cured of depression and PTSD, but she has reinforced her coping skills and learned to trust herself through therapy. Woodward learned about the ELHI center while attending Celebrate Recovery, a Christan support group for those who have experienced trauma and struggle with substance abuse. In September, she moved to Ignacio to be closer to ELHI, where she works with adults and helps run the after-school program for children on Wednesdays. “I am not going to save the world, but I’m going to be a positive contribution to it,” she said.